The material cork we mainly know from wine bottles or pin boards is actually capable of much more. Cork is not only natural, renewable, sustainable, non-allergenic, impermeable and has a natural fire resistance, but is also an extremely light and resistant material, called natural leather. A cork tree lives for about 200 years, only after 25 years the bark is harvested the first time without harming the tree. Then every 9-12 years the cork gets harvested again, manually with much care, by experts. As plastic stoppers are taking over the wine yards, cork famers are facing serious problems to mantain their woods and own living. 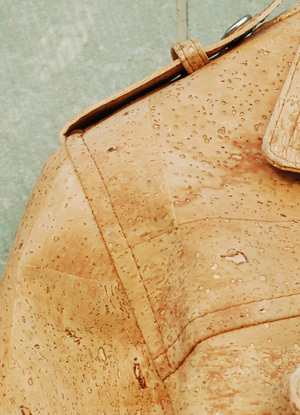 Together with local craftsmen terials is developing different kinds of cork fabric to achieve the perfect ‘natural leather’ for accessories and fashion apparel.